Patients range from neonatal to teenagers. Therefore, the blood tubing used to dialyze these patients comes in many sizes and configurations. To overcome the challenge of small tubing sizes for young children, Transonic recommends the use of standard sensors on Transonic Clear Advantage Tubing sets inserted between the smaller blood lines and needle lines. 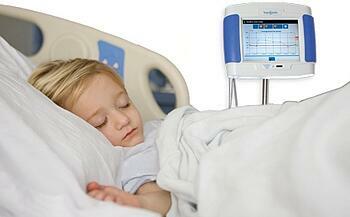 Th Monitor’s software normalizes access flow in children by correcting the raw access flow data for body surface area and reporting mL/min/1.73m2. Goldstein and colleagues2-5 from Texas Children’s Hospital report that ultrasound dilution (UD) is a valid measurement of access flow in children. “When the uncorrected flow value reported by UD is corrected for patient body surface area, UD is predictive for the presence or absence of severe AV graft stenosis, regardless of patient size. In 2001, Texas Children’s Hospital instituted a rapid referral policy (within 48 hours) for AVF or AVG angioplasty using monthly Flow-QC surveillance to access vascular access flow. Children with a corrected vascular access flow of less than 650 mL/min per 1.73m2 were referred for balloon angioplasty. 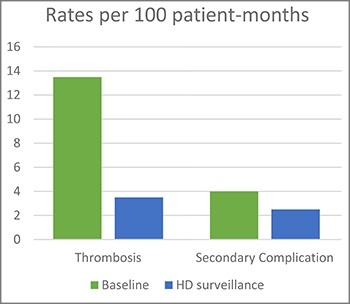 The practice led to a 90% reduction on vascular access thrombosis rates and a 40% reduction in vascular access management costs, compared with the institution’s previous venography surveillance protocol. Moreover, it also led to fewer missed school days, less separation from family and peers, and fewer invasive procedures. In 2015, Ashoor and colleagues published a study that reports their experience monitoring AV accesses by ultrasound dilution technology in pediatric patients at Boston’s Children Hospital.6 They report that their AV access thrombosis rates fell from 13.5 per 100 patient-months on HD during the baseline period to 3.5 per 100 patient-months on HD during the screening period; secondary complications declined from four events per 100 patient-months during baseline period and to 2.5 events per 100 patient-months during surveillance period; mean blood flow rate by UD measurement was lower in AV accesses that went on to thrombose compared to those without thrombosis (1,203 mL/min/1.73 m2 vs. 1,683 mL/min/1.73 m2) and median flow rate increased from 730 mL/min to 1,180 mL/min following angioplasty. They concluded that noninvasive UD screening is very sensitive in detecting hemodynamically significant stenosis and can decrease AV access thrombosis rates. 1Chand DH et al, "Barriers, biases, and beliefs about arteriovenous fistula placement in children: a survey of the International Pediatric Fistula First Initiative (IPFFI) within the Midwest Pediatric Nephrology Consortium (MWPNC)," Hemodial Int. 2015; 19(1): 100-7. 2 Chand DH et al, "Hemodialysis vascular access options in pediatrics: considerations for patients and practitioners," Pediatr Nephrol 2009; 24: 1121-28. 3 Goldstein SL, Allsteadt, A, "Ultrasound Dilution Evaluation of Pediatric Hemodialysis Vascular Access," Kidney Int 2001; 59(6): 2357-60. 5 Goldstein SL et al, "Noninvasive Interventions to Decrease Hospitalization and Associated Costs for Pediatric Patients Receiving Hemodialysis," J Am Soc Nephrol 2003; 14: 2127-2131. 6 Ashoor IF, Hughson EA, Somers MJ, "Arteriovenous access monitoring with ultrasound dilution in a pediatric hemodialysis unit." Blood Purif 2015; 39(1-3): 93-8.